Update 1: Check out “Making Friends With Some Guy Named Mike” on this band page of mine for an awesome example of this studio in action. 20 years ago digital home recording wasn’t plausible. 10 years ago we started to see its potential, but most hobbyists (read: very cash-limited people) were limited to using still-primitive versions of multi-trackers such as Cakewalk, Cool Edit Pro or Cubase with either COTS Sound Blaster PCI cards or ridiculously over-priced, high-noise, high-latency specialty cards with break-out boxes such as the Lexicon Core 2. Running on Windows 95 or 98, we regularly struggled with the stability of the platform and device drivers. 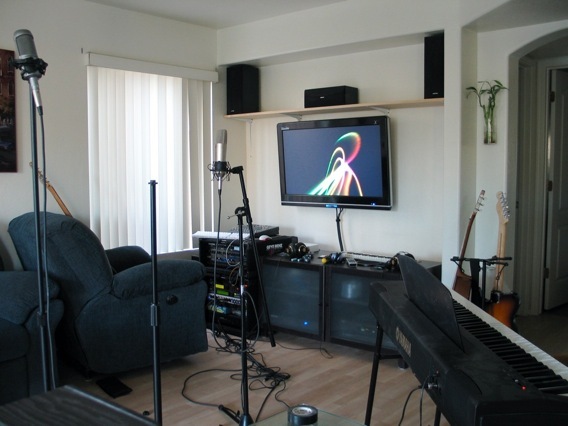 Today, you can have your own personal studio capable of producing DVD-quality recordings by adding a thousand dollars of equipment to your existing computer and music rig. Here’s my living room/home theater/recording studio/Mac haven, all driven by a single Mac Mini..
Here’s are the core components..
Big 1080p LCD television/monitor. The Mac Mini drives this beast with a DVI-to-HDMI converter cable. Logic Pro (Apple’s recording software). For my needs, it’s really either Logic Pro or Pro Tools. For various reasons I’ve stuck with Logic Pro run in a distributed manner with other Macs in the house using built-in Xgrid functionality over gigabit ethernet. PreSonus FirePod. This is a truly outstanding input device for recording the entire band simultaneously. The unit is rack-mountable, connects via FireWire and optical cables, and has pristine noise-free pre-amps. Instruments. I have a full-size Yamaha keyboard (pictured), a bunch of vocal mics and guitars, and a rack of mediocre analog schwag. BYOI, whatever ‘I’ happens to be. If you’ve already got a Mac setup and some music equipment, grabbing Logic Express, PreSonus FirePod, decent vocal mic and a bunch of cables for $1K will turn your system into an audio powerhouse which your friends will envy. I’m running something of the same, but i’m between Logic and Ableton Live (which I would utterly recommend). I’ve heard the Presonus is a nice bit of gear, but the Focusrite Saffire Pro is tugging at my wallet at the mo..
I’ve heard good things about Ableton Live, but haven’t tried it yet. I’ll have to try a demo some time. I forgot to mention that the driveless NewerTech MiniStack 2 kit is *definitely* the way to go for external storage. It has both FireWire and USB 2 hubs built-in, an internal fan to keep the drive cool, and is aesthetically pleasing and consistent with the visual style and layout of the mini. I’m trying to get a home studio setup with a Mac Pro 2.66 GHz processor, 2GB RAM, and the usual. I’m wondering about the default soundcards they come with. Will that be sufficient or will I need to upgrade. I won’t be recording live sets so 1 track at a time will be the norm but I’d like to have the option if I could (cost vs. benefit?). Also you said that you liked Logic rather than ProTools. What are some of the main differences of the two and why you prefer the prior? And about the input interface should I even consider a cheap USB Mixer like a Behringer or go with something else (another interface like the pod or maybe an internal mixer)? I’ll be using a variety of instrumentation from guitars to midi keyboards, beat machines, sampling, and vocals. And last, what monitors will be the best “bang for the buck”? ps. You can reply to my email. And your studio looks AWESOME! I’m not familiar with the stock audio hardware of the Mac Pro, but strongly doubt your ears would be pleased with anything the default hardware can produce. Since you’re doing MIDI, I’d look for an external FireWire or USB device which has MIDI, XLR (mic) and TLS (guitar) connections; if you’ve got those, you’ll be able to hook up pretty much everything you’d want to play at home. I’ve had line noise issues with many of the low-end interfaces out there, so I would recommend the FirePod for home studio use if you can afford it. If not, make sure you buy from someone with a good return policy. Why Logic over Pro Tools? Mainly personal preference, but running Logic Node on my other Mac usually gives me enough CPU power to play back stuff without freezing, bouncing or temporarilly mixing down tracks. IMHO the most cost effective monitors are… none. If it’s just you, I’d recommend grabbing a good pair of studio headphones and perhaps a small headphone amp for expansion or friends. For home studio use I wouldn’t recommend a hardware mixer unless it fully intergrates as a control surface with your software. I used a 16-channel, old school hardware console in the home studio for years, but eventually sold it because it’s not worth hassle. If you’d like a control surface, grab a cheap USB one or use the widgets on your keyboard over MIDI or USB. Sweet setup! I blindly bought a Peavey USB mixer (USB 10) without waiting for FW interfaces, so I’m stuck with step recording using Cakewalk Sonar on Windows XP. I use Reason 3 for my Mac G4, dual 1GHz and output the audio from that to the usb mixer. I used to have some musician buddies of mine over on the weekends so that we can jam/record, but that didn’t last as they lived too far. I’m trying to do everything solo now, but I’ve been too busy. Nevertheless, I’ve been looking into other people’s home rigs and getting ideas. Great suggestion by the way, and I’m now looking into buying a Intel-based Mac within the year. Very nice setup. It definitely inspires me. I love the idea of the large video monitor. Something like that has been on by “eventually” list for some time. Looks fantastic. I’ve been slowly upgrading my studio and added a MacBook and a Firepod earlier this year. A definite improvement over the old setup. I love being able to track more than two tracks at a time and I love how much quieter and less obtrusive the Mac is than my old Windows desktop machine. The next two studio purchases are software and a new MIDI keyboard controller (the old one is starting to misbehave more often than it works correctly). Picking software is always a task, though, especially since I have not found trial versions of either Logic or Cubase (the two frontrunners for me) that will work on Intel Macs. How do you find Logic works on the Mini, especially for tracking/mixing audio? Did you give Express a try and found it insufficient before moving to Pro? The Mac Mini keeps up well enough, but I have to run Logic Node on another machine after a certain point. Logic Express is cool, but unfortunately you can only use Logic Nodes with the Pro version. Very nice setup man! I was wondering, I think I have the same keyboard, Yamaha P60. I have it connected via MIDI into a Firebox and also with the Headphone out to the Firebox since this model doesn’t have dedicated left/right outs. It seems however, that the quality isn’t that great. Can you recommend any decent Midi software to reproduce realistic piano sounds? From what ive seen Synthogy Ivory is apparently good. Does Logic come with any Midi samples? Logic comes with some decent samples, but you wouldn’t want to use Logic for live play. I got an Alesis synth with add-on jazz piano samples years ago that sounds really hot, but it wasn’t cheap and I’d be more inclined to go with a pure software solution these days. love the setup, was wondering if you had any acoustical problems in the room? haha, i’ve only used those three programs (cakewalk, cool edit pro, and cubase) and in that exact order. Does anybody have any encounter with the Philips MC235B Flat Wall Mountable Micro Shelf Program I was thinking about acquiring it and just wasn’t certain if its the ideal 1 to buy. I’m thinking about setting up my basement for recroing studio similiar like yours. Do you have any new updates in your studio ? I’m continually updating my studio so some of the components have changed, yeah, but the general “gist” of the system is still the same. I still drive production sessions with (now upgraded) Mac Mini Server and Logic Pro 9 using PreSonus hardware for I/O. The biggest improvements I’ve made since originally writing this article have honestly been in the time spent learning the idiosyncrasies of the tools and getting to the point where I can do everything from studio work to live shows without issue, and then post-produce and master everything in a way that ends up sounding really good. I’ve also built the disc replicator–which is totally awesome btw–and highly recommend checking out that article as well if you haven’t seen it yet. Look me up on youtube, I sell studio sound proofing panels made from cnc cut hardboard frames (very light to hang on your wall) and had 2″ thick of sound absorption. How much would it cost to set up a studio? Next Next post: Would You Like To Join The "Virus" Network?